PoPville » Another End of an Era – Murphy’s Closing in Woodley Park Sunday – Fine Italian Dining Coming? 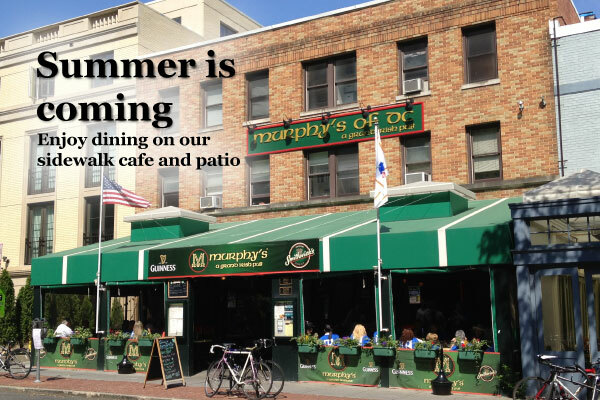 Another End of an Era – Murphy’s Closing in Woodley Park Sunday – Fine Italian Dining Coming? A couple weeks ago, after Duffy’s closed, we talked about the best regular bars left in DC – Murphy’s was number 10 on my list. Ugh. I’ve called to confirm and it’s true – they’ll be closing after last call on Sunday because they weren’t able to renew their lease. Updates on the Italian restaurant when/if more info is known. Since the day we first opened our doors on March 17th 1986, Murphy’s® of D.C. has been the home of Irish hospitality in the nation’s capital. Our extensive menu specializing in delicious pub fare coupled with the finest beverages has been pleasing Washingtonians and visitors to our city alike for over twenty-three years. Our guests have a choice of seating, ranging from our comfortable upholstered window seat booths, wooden tables as well as stools at our long traditional solid wood bar. A year round seating option is our newly renovated and spacious sidewalk patio. Though most popular in D.C.’s warmest months, the awning and heating system ensure our guests comfort during our city’s cooler months also. During winter months our guests enjoy the three sided wood burning fireplace inside. Whether warming your hands beneath the mantle adorned with an antique forge bellows, or basking in the glow of the flames from across the pub, the fireplace is a gathering spot and a symbol of fáilte, the Irish word for welcome. Murphy’s® of D.C. showcases the best in live Irish entertainment. Whether playing traditional Irish pub songs or more contemporary rock and folk, our musicians all make sure the crowd has fun. From almost any spot inside the pub guests are treated to sporting events and news reports on one of our large flat screen televisions. Our friendly and attentive staff will be glad you stopped by. Stay for the craic and raise a toast with us: Slainte! to your very good health!